There’s a different rhythm to early sound films. Though discussion always focuses on how many actors and actresses found it difficult transitioning from silent films to talkies, be it due to an unsuitable voice or a lack of proper vehicles, there was also a transition required of the people behind the cameras. The staging and pacing was different once dialogue was required. Indeed, even filming was different, because you had to accommodate for the actors having to say actual words out loud and capturing them on microphone. So, just like with actors, only the most adaptable directors carried on and even flourished. John Ford in America, to name one example. Hitchcock in England. And Julien Duvivier in France. 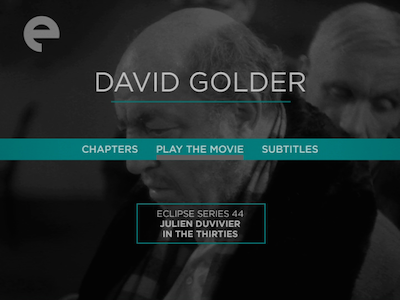 The Eclipse set Julien Duvivier in the Thirties offers up four of the director’s first sound films, starting with DavidGolder, released in 1930 and made a full decade after Duvivier’s first silent film. Though neither as well-known nor as accomplished of the director’s most popular feature, Pepe le moko, David Golder--and indeed, all of the quartet here--shows a skilled artist eager to master his evolving craft. 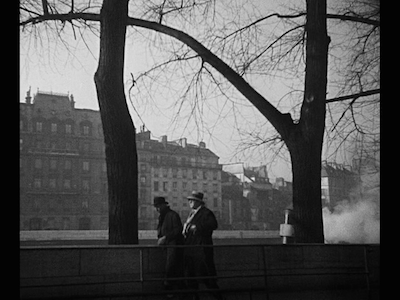 From the opening sequence of David Golder--a rapid-cut, impressionistic overview of the cultural, industrial, and economic situation in France at the 1920s--it’s clear Duvivier is ready to zoom into a new era. David Golder was based on the novel of the moment, a dramatic tome by Irene Nemirovsky, who enjoyed a renaissance in recent years with her novel Suite Francaise. The David Golder of the title, played by regular Duvivier leading man Harry Baur (the Jean Valjean of Raymond Bernard’s Les Miserables [review]), is a free-market businessman about to get a lesson in the ups-and-downs inherent in capitalist bullishness. Our first exposure to the man is his relishing the ruin of a former partner who plotted against him and struck out on his own. When said partner commits suicide, Golder is unmoved. He insists the traitor should have reinvented himself, something Golder has had to do many times. Turn your loss into a win. Karma comes around pretty fast, though, and Golder finds himself on shaky ground, and partially because of the very thing he tried to deny in business: a personal life. Golder’s wife (Paul Andral) is living a lavish existence on the Riviera, spending money alongside the couple’s spoiled daughter, Joyce (Jackie Monnier). As things unravel for Golder, he shows where his true loyalties lie. He’d rather let his wife sink if it means his daughter can swim. Unsurprisingly, Mrs. Golder is not going to go down so easy, not without pulling the rug out and dragging her husband with her. David Golder touches on a lot of important issues, including class, privilege, and race. Despite his money, there are many who look down on Golder because he is Jewish. Baur plays the dour character with an appropriate heaviness. He is as self-isolating as he is self-made. As a father, he is exasperated and indulgent, and the sprightly blonde Monnier uses his own weight against him, both narratively and in terms of performance. She is as airy as he is grounded. 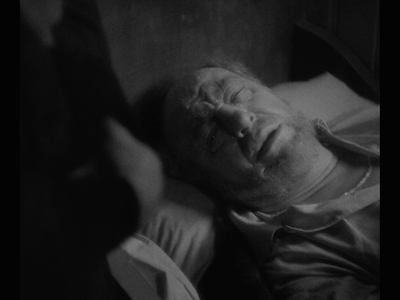 The contrast tires us as much as it does Golder himself, meaning we are as exhausted as he is at the end, a strange feat of empathy on the part of Duvivier. 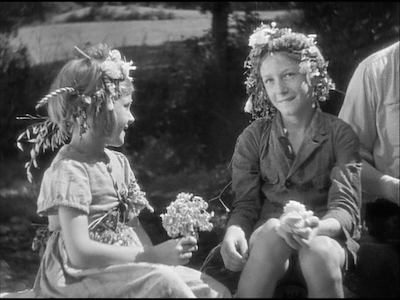 Though the camera stays relatively stable for the majority of Duvivier’s film, it never feels dull or static. 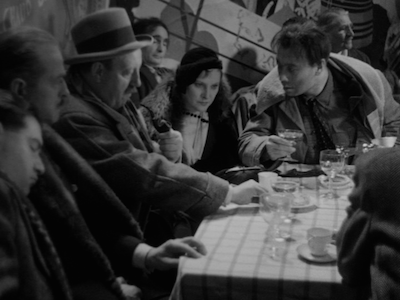 Scenes are long and there are gaps in dialogue, the way there often was before directors learned how to fill all that space, but there is also a precision to what is chosen that suggests that Duvivier is already comfortable with conversation. Sure, more is said that in a silent film’s intertitles, but the lack of excess means no word--or moment--is wasted. By 1932, when Duvivier remade his own Poil deCarotte, any hesitancy about movies with sound had long since passed. One could argue there might have been an added confidence in fleshing out material he already knew so well, though my own memory of the silent version of Poil de Carotte is hazy at this point, so I can’t say definitively how much the later effort differs [my review of the 1925 version is here]. Poil de Carotte is based on a novel by Jules Renard. It stars Robert Lynen as “Carrottop,” the youngest of three children in the Lepic family. His nickname is for his red hair, given to him affectionately by his father (a returning Baur), but generally used derisively. The Lepics are dysfunctional on their best day. Madame Lepic (Catherine Fonteney) doesn’t much care for her third child, instead doting on her oldest boy Felix (Maxime Fromiot), a bully and a thief, and the self-absorbed middle child, the girl Ernestine (Simone Aubry). Monsieur Lepic means well, but he’s distracted, particularly once his campaign for mayor is underway. This leaves Carrottop (real name: Francois) to his own devices, and the imaginative boy is plagued by ghostly visions and a suicidal impulse. 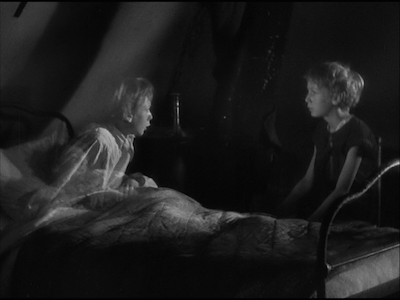 Both are shown by Duvivier via inventive special effects, including one scene where two dream images of Carrottop debate his future over the boy’s sleeping body, the proverbial angle and devil sitting on his shoulder. The superimposed figures are simple, but effective. 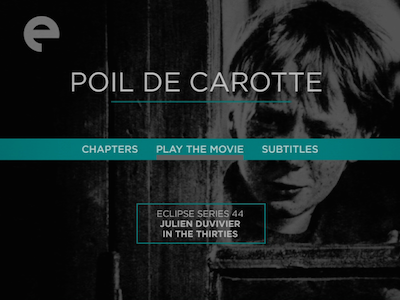 Duvivier is stretching himself throughout Poil de Carotte. Armand Thirard and Emile Monniot’s cameras have become more active observers, sometimes probing a scene, moving between the players, and following the action within the frame. (Thirard was also a cinematographer on David Golder). In a particularly important segment, Carrottop’s youthful desires turn to a jealous rage, and the filmmakers let the anger take over. As the child whips on his horses, driving his wagon faster and faster, they use overhead shots of passing trees to show speed, POV vantage points from the front of the wagon to demonstrate the child’s looming madness, and also a wide view from behind, showing us how wild Carrottop’s path has become. The cutting is sharper here, too. Editor Marthe Poncin uses dialogue to weave in and out of scenes, ironically juxtaposing a line with the image that follows, or stitching two separate pieces of dialogue together to connect different events. Of course, all the technical wizardry in the world wouldn’t save Poil de Carotte if the performances were bad, and Duvivier pulls a particularly impressive turn from his young star. Lynen is the essential component of the film, and his performance is full of humor and emotion. He is equally convincing joking around as despairing over what he perceives to be his inescapable fate. The climactic scenes of his final attempts to end his life are disturbing and raw, but perhaps more memorable is the tenderness that comes before, when he shares a sweet moment with his childhood romance (Colette Segall). It’s an exchange so honestly felt, it’s almost too bad the film didn’t end there, with the innocence of young love giving Carrottop courage to carry on, rather than the borderline mawkish reconciliation between father and son. The following year, Duvivier would attack genre in the most impressive La tête d’un homme, adapting the work of Georges Simenon. 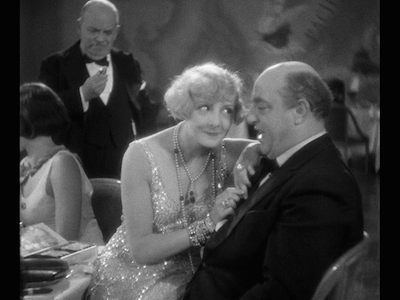 On the surface, this is a fairly conventional procedural: a man (Gaston Jacquet) loudly grouses in a crowded bar that he’d pay handsomely for his rich aunt to be killed and an opportunistic eavesdropper takes him up on it. When the deed is done, Inspector Jules Maigret (Baur) has to figure out who did the deed. He suspects the nephew is involved, and that the dim delivery man (Alexandre Rignault, Eyes Without a Face) that they’ve apprehended is just a patsy. The real culprit is Radek (Valery Inkijinoff), a Czech immigrant with a terminal illness and sociopathic tendencies. 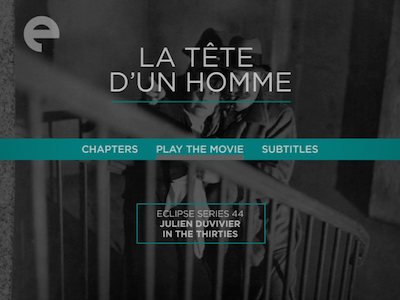 La tête d’un homme isn’t really a mystery, it’s a character study. 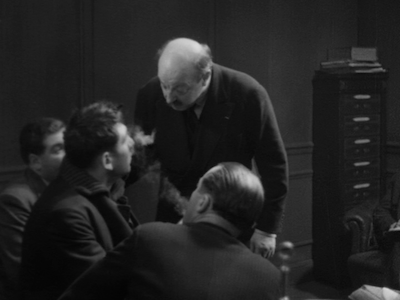 Duvivier shows us all the pieces, and we are generally one step ahead of Maigret. The central question is what is motivating Radek. Is he just a bad dude or is there something else behind it? His character unpeels slowly, with Inkijinoff projecting a cold confidence that eventually devolves into a more unhinged pathology. His performance in the latter half of the film seems to be cribbed somewhat from Peter Lorre’s in M [review], but Inkijinoff doesn’t sell it nearly as well. He’s best when being charming and calculating. Harry Baur is barely recognizable as the detective. He is calm and cool, the wheels constantly spinning in his brain, and relatively unflappable. It’s easy to see why Duvivier used him over and over. You hardly track that it’s the same man from picture to picture. He can do anything, and should be listed alongside Michel Simon and Jean Gabin as one of the unforgettable masters of early French cinema. The final film in Julien Duvivier in the Thirties is perhaps the best. 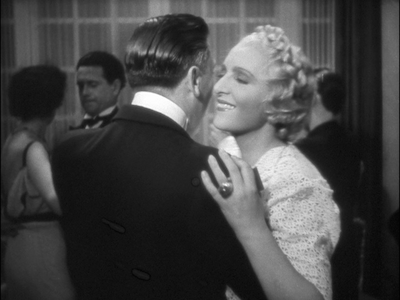 Released the same year as Pepe le moko, Un carnet de bal (or Dance Card) is a crafty ensemble piece reminiscent of Max Ophüls. It stars Marie Bell as Christine, a newly widowed woman in her late 30s whose present grief inspires her to look back at past loves. A dance card from a ball she attended at age 16 provides a road map, of sorts; she will visit each of her former dance partners and see how the intervening decades have treated them. Also, they will hopefully know the whereabouts of Gerard, the one who got away. What Christine finds on her journey surprises her. Life takes funny turns in twenty years. The lawyer has become a crook (Fernandel), the artist is now a priest (Harry Baur). Some of the men have married, some have had children. Most have realized their dreams on some small scale of success, even if, in some cases, tragedy followed. Christine is ill prepared for these turns of event, and even less so for the one underlying theme in the tales of all her former suitors: their lives changed the night of the dance, the night she broke all of their hearts. Thought never explicitly stated, what Duvivier’s script explores are the reverberations a small action can have. In this case, the casual offer of affection, and the subsequent withdrawal of the same. Christine is never presented as callous or mean, except perhaps by the mother who claims her son took his life when Christine rejected him; yet that mother is reacting with her own broken heart, and we have no reason not to believe Christine when she says the boy had never confessed his feelings. Or could that be Christine’s greatest sin? She was oblivious. Even now, her real goal isn’t really to catch up with these old beaus, but to find out something about herself, and the irony is that, despite how things turned out for them, the one-time suitors whom she hurt have lived richer lives than the one of sheltered wealth she chose instead. 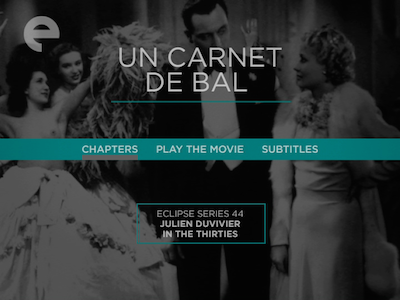 Un carnet de bal flows smoothly from one episode to another. Duvivier plays most of it straight. Outside of some intriguing cross-fades, he never really calls attention to his technique, the craft has become invisible. In fact, the director inadvertently creates his own metaphor for his style. When Christine first starts to reminisce about the fateful night of her youth, the memory literally dances in, a slow superimposing of past over present. It’s beautiful and elegant, an enticing invitation to follow where the reverie will lead. As an artist, Julien Duvivier has done the same. His inventions have intrigued, his constructions occasionally dazzled, even as he slowly erodes the evidence of each, immersing us in his narratives until we are so thoroughly involved, we forget all else. These discs were provided by the Criterion Collection for purposes of review. 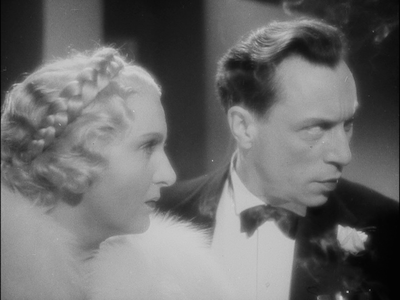 In "Un carnet de bal", Louis Jouvet plays the crook. 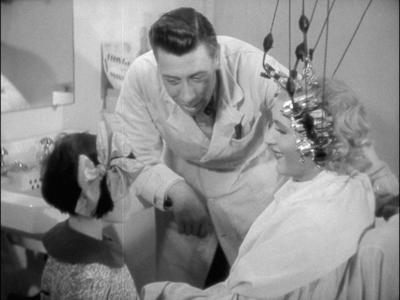 Fernandel plays the hairdresser.